According to data from the Pew Research Center, there are currently 71 million millennials in the U.S., representing nearly one-quarter of the nation’s population—one-quarter! While there’s some debate as to who qualifies as a millennial, according to the Census Bureau, they’re those born between 1982 and 2002, making them between 36 and 16, respectively. A large age range, sure, but no longer is the term “millennial” synonymous with your gum-popping, Snapchat-ing tween niece or nephew. Some may still be prepping for their driver’s exams, but many millennials are out in the world working as full-fledged professionals. They’re your physician’s assistant, your office manager, your lawyer, your barista…and they’re making major waves in the housing market as more and more move from renters to homeowners. 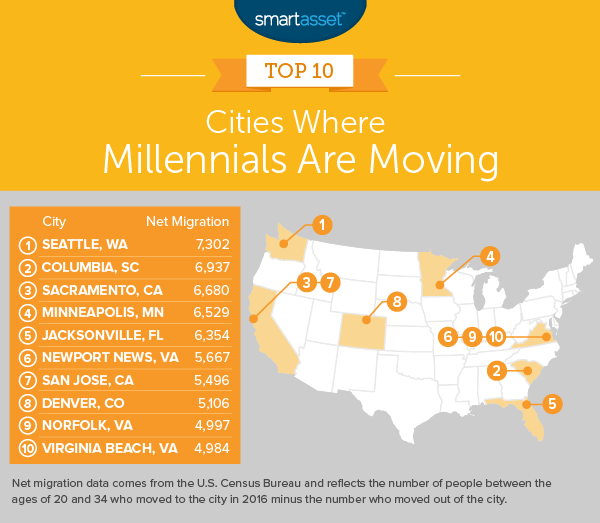 Where are millennials choosing to live, and, more importantly, where are they moving? A recent SmartAsset study looked at immigration and emigration data from the U.S. Census Bureau for 217 cities. 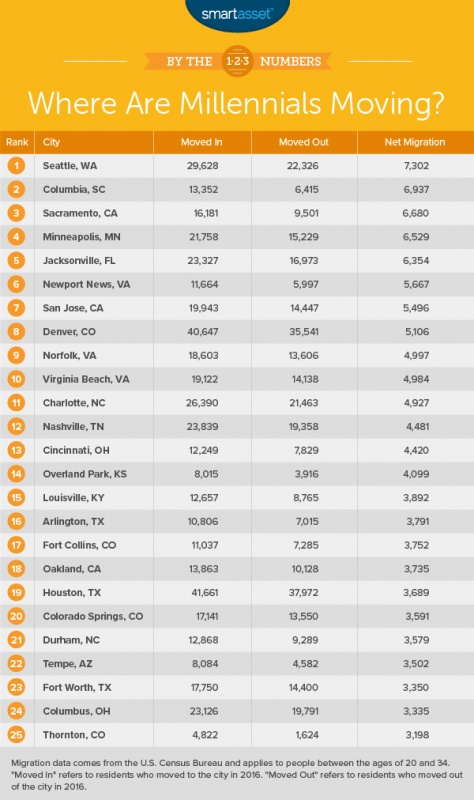 The data shows the top 10 cities millennials are moving to, and the info may surprise you. For instance, New York City is not a popular choice for today’s movers and shakers. In total, around 69,200 residents moved to New York from out of state, while nearly 95,000 left the Big Apple for another state. Virginia, on the other hand, is attracting mobile young adults, reigning in three of the top 10 cities. Old Dominion is a hot spot, likely for its somewhat low cost of living, younger crowd (median age is 38) and close proximity to the beach. Washington is also a top choice for millennials, but this is less surprising when you consider the speed at which innovative tech companies are surging to Seattle—the main area of interest and No. 1 on the list for today’s moving millennials. 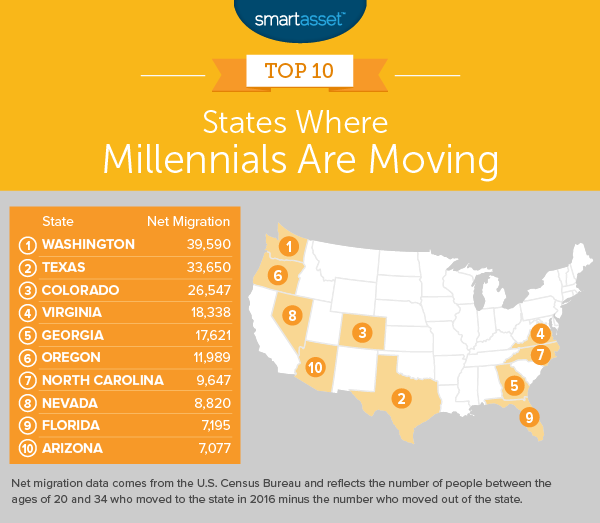 For more information on where millennials are moving, check out the following infographics below, or view the full SmartAsset study. For more real estate information, please contact PR@CBHarper.com or call (210) 483-7017.